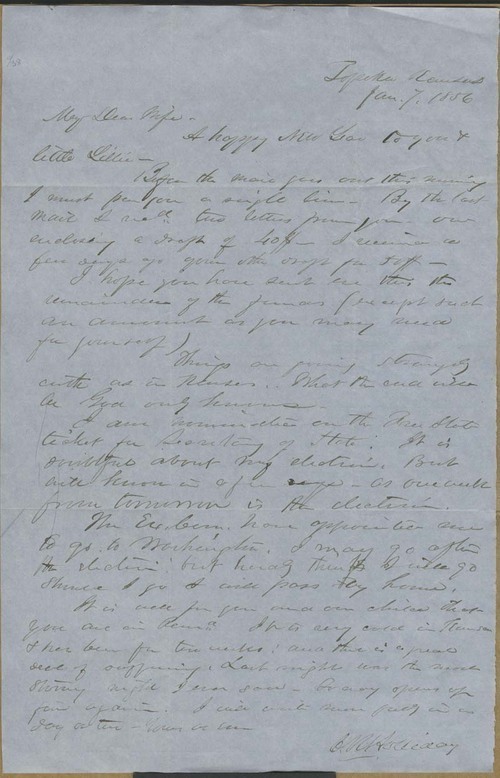 Cyrus K. Holliday, reelected on the 6th for a third six-month term as president of the Topeka Town Association, wrote from Topeka, Kansas Territory to his wife, Mary Holliday, in Meadville, Pennsylvania. He had been appointed to visit Washington by the Free State Executive Committee and nominated for territorial Secretary of State (losing in the January 15th election). Cyrus had received the money drafts Mary sent. He reported cold, stormy weather.